What qualifies as church music? Where did church music come from and why is it the way it is today? For some, church music is a very familiar aspect of their culture due to their upbringing or lifestyle, but for others, it is not. Regardless of your exposure, music itself has greatly evolved over the centuries and so has church music in tandem. 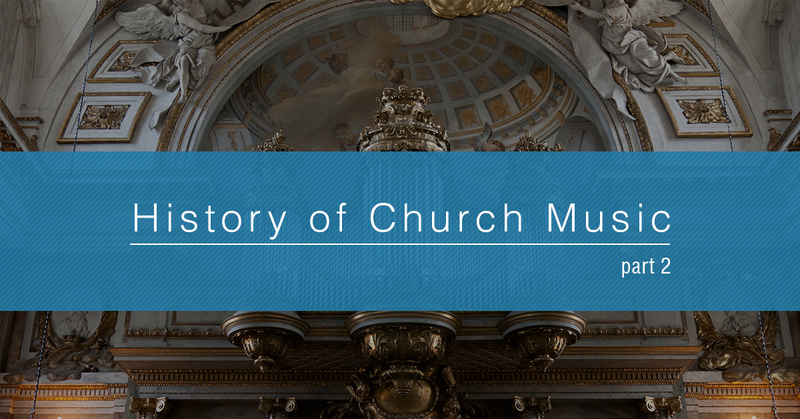 In one of a recent post, we began talking about the history of church music. Early church music consisted primarily of voices due in part to the early church goers beliefs that musical instruments were worldly. The next basic stage of music’s evolution came during the 1100s and 1200s with the incarnation of the Gregorian Chant which is much like it sounds: Music with very little texture and without musical instruments. Next came the Mass that was and is primarily part of Roman Catholic and similar denominations’ worship services. A word that should be greatly associated with mass is tradition: Mass was and still is ritualistic in character. Masses consisted of cappell or human voice alone, or obbligatos in which musical instruments accompany the congregation’s voices. Even with the integration of musical instruments into Mass, Gregorian chants still accompanied many of the songs at the end. With the invention and continuous design advances, the organ became a big part of Mass. Many of the organs in churches and cathedrals were not only a big part of the mass, but they were also an integral part of the visual extravagance of many churches: The church organs themselves became works of art to accompany the beautifully crafted icons and other religious decor and worship items. Carols were the next category in church music’s evolution. Carols were generally not just for church services but were religious and communal in nature. Though carols are believed to go back to the 1200s, they were incorporated into church services during the 1700s and 1800s and were sung especially during Christmas. The structure of carols is much like the chord structure of the Medieval music before it. During the Reformation, because Martin Luther encouraged the singing of carols and he himself was a critic of the church, the church sang carols as part of their services less and less. Today, we still sing some of the popular hymns that can be traced back to this period, such as many Christmas carols and those sung during Advent and Easter celebrations. The origin of hymns can be traced back to the early church during the first century: Early hymns were called canticles and were sometimes actual biblical passages. Hymns were part of the Christian tradition apart from the Catholic faith. Still, factions arose within the Protestant faith over the singing of hymns. Some believed that hymns needed to be directly from the Bible to be worshipful and others went to the extreme and again eliminated instruments from their worship services causing the hymns to be chanted. Despite the different ideas with the faith, hymns continued to be a large part of the Protestant worship service through the centuries and still in many churches today. Gospel songs soon joined hymns in the Protestant worship services but did not become a part of the Catholic faith which caused the two variations of the same faith to continue to polarize. Gospel songs were developed mainly by African-Americans during the time of slavery in American. Many of these songs had a different feel than traditional hymns, but some still followed the structure of hymns. Later, hymns were influenced by this new style of worship music in many ways, including tempo. Many of the most popular and well-known hymns were influenced by gospel music: “Amazing Grace,” “How Great Thou Art,” and more. Hymns are still a part of traditional Protestant churches and still influence much of contemporary worship music which has modernized hymns as a whole or included iconic phrases in their song structure. Church music has evolved with the times and includes many of the modern instruments and modern styles of popular music. As soon as the organ was invented, it became an integral part of church music and in many traditional churches is still a main part of the worship music. In many cases, it is not just an instrument, but it is part of the immense work that goes into making the church immaculately decorated and visually worshipful. And, even though some churches have steered away from using the organ, the organ has undeniably influenced not only the development of church music but also the Christian faith and tradition. If you or your church are looking for a high-quality organ, you have come to the right place. Viscount sells traditional-looking church organs with hybrid systems that will produce a sound unparalleled by any other brand. We also sell church organs that are completely digital. Our Physis® technology produces not just a sound that sounds like an organ, but it imitates the actual sound of the organ’s pipes interacting with each other and with the room environment, to give you an unmatched digital organ. Whichever organ you choose, if you buy a Viscount church organ, you will be buying an organ that is crafted to sound and look like a masterpiece. Find a Viscount church organ dealer near you and stay tuned for more post about the organ and news about Viscount!